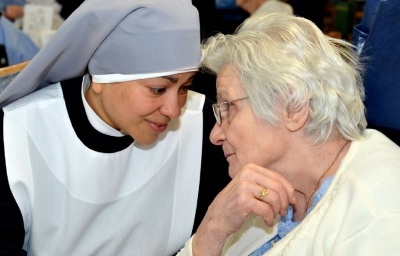 Before the Little Sisters of the Poor were famous for challenging the HHS mandate, my daughter, Molly, volunteered at one of their homes for the aged. Her stories about the joy in that house so inspired me (An old folks’ home that is not depressing? People need to hear about this!) that I contacted them and set up this interview for Catholic Digest. This article originally appeared in Catholic Digest, September 2013.